One weekend before I flew home from Europe, I decided to first take the train from Amsterdam to Bruges, Belgium. My goal: to find the best Belgian chocolate in Bruges. (There are also full-day tours of Bruges from Amsterdam). Why Bruges? 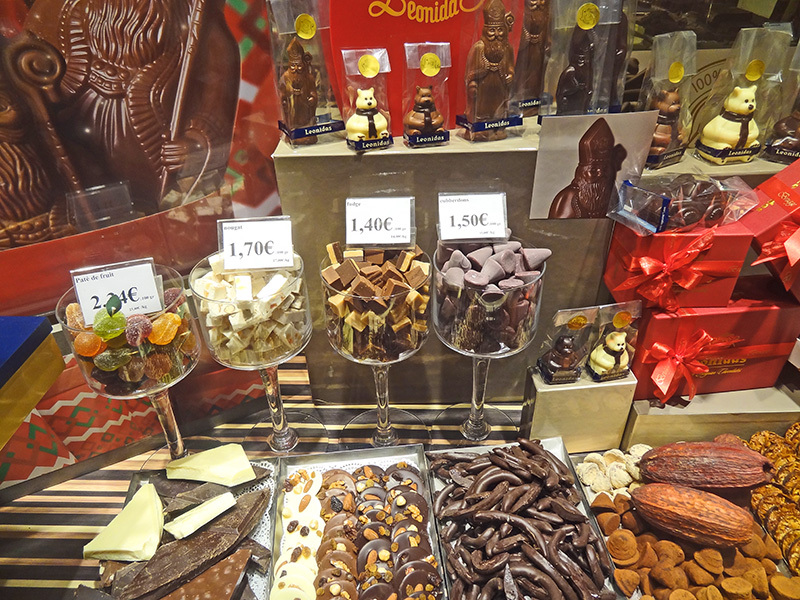 Along with it’s famous medieval architecture and canals, it’s also a Belgian chocolate hot spot with an incredible number of chocolatiers and shops, a nirvana for lovers of chocolate. My search, however, turned out to be considerably harder than I envisioned. You can follow it on the interactive map below. My methodology was quite simple: I looked at recommendations about purveyors of Belgian chocolate in a guidebook or two, and then walked the streets in the central area of the old city where all the chocolatiers were located. A visit along the way to Choco-Story, the city’s interesting Chocolate Museum, helped answer a few questions on every chocoholic’s mind, such as is it an aphrodisiac (perhaps, yes), does it cause high cholesterol (no, it reduces it), does it make you fat (dark chocolate doesn’t), etc. My first stop was at Dominique Persoone (also know as The Chocolate Line), an attractive little store on Simon Stevinplein across from a little carnival that had been set up in the square. I went in and asked for three Belgian chocolates: one with a cherry liqueur, another with walnuts (it was shaped like a walnut shell on the outside and filled with chocolate with little pieces of walnut) and the third with a biscuit inside (which the saleslady recommended since it was a popular item at their shop). The one with the cherry was over the top and the walnut excellent, but I was surprised by the biscuit. For some reason I had expected a tiny cracker inside but it turned out to be crunchy chocolate instead, interesting but not what I had expected. Nevertheless, I rated each well above any other chocolates I had ever tasted. 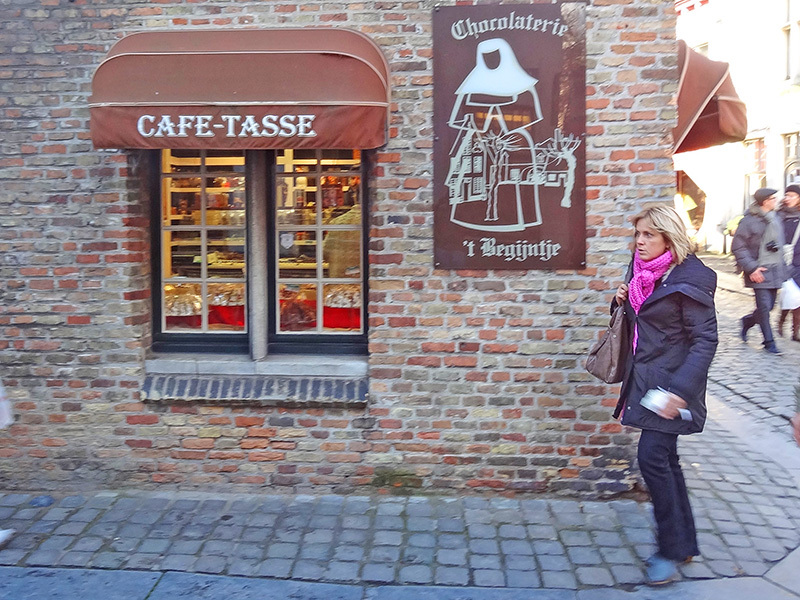 I headed over to Café Tasse, a small Belgian chocolate shop by the Begijnof which lured me in since I misread a sign which I thought said they were associated with the famous Beguine Convent nearby. Inside I found an interesting array of chocolates and bought a Grand Marnier, a Cointreau, an Irish cream and a caramel with nuts as dessert. I was only in the second shop and already liqueur-filled chocolates seemed to be becoming a theme in my search. The Cointreau, as it turned out, was very creamy and delicious, but the Grand Marnier left a lot to be desired, namely the taste of Grand Marnier. I wasn’t enthused about the Irish Cream either, probably because I thought it would taste more like Baileys, although the caramel, on the other hand, was quite good. (Note: while updating this post I’ve been unable to verify whether Café Tasse is still open). Wandering further I came across Detavernier Patisserie, which also incorporates the Tearoom Carpe Diem. It seemed popular and appeared to be doing a brisk Belgian chocolate business. I wandered inside but found that its main business was pastries (it was a Patisserie, after all) so I decided to pass them by. The fact that the super-rich chocolate I was buying, in addition to the occasional free sample, was making me lose my appetite probably helped in that decision. This map depicts a walking tour of most of the places mentioned in this article. It is interactive; press +/- to enlarge it or make it smaller. It can also be viewed, and the route followed, on your smartphone. Around the corner on Katelijnestraat I stumbled across Lady Chocolates, which also seemed popular gauging by the number of people going in and out. But when I saw the promotional signs in the windows – “Belgian Chocolates – Promo Best Price – Best Buy” – I realized its popularity was based on price and decided to pass it by. Ditto for Daya Chocolates (“1 kg Belgian chocolates for €12.80”), Sukerbuyc Chocolaterie, Verheecke, Brown & Sugar and Moeder Babelutte (despite its chocolate fountain and cups of hot chocolate you could buy there). They al seemed to be targeting the mass market, rather than concentrating their efforts on producing the sublime chocolate I sought. It was the next day when I discovered Dumon. It was in a tiny 400-year-old brick building on the street directly behind Market Square, looking more like a cottage than the chocolate Utopia it turned out to be. It was here I found the Belgian chocolate for which I’d been searching. The caramel almost made my tongue melt. The cherry (“be careful, it still has the stone inside”) was bursting with a delicious cherry liqueur. The walnut and all the others I tried were superb. Dumon has been in business only twenty years, which doesn’t seem like a very long time compared to some of the other shops, but its chocolate was far and away the most incredible Belgian chocolate I had tasted in Bruges, or anywhere for that matter. And it’s a family operation, with Mom and sister behind the tiny counter, happy to give you samplings of their luscious little masterpieces. The cheerfulness of the whole place only seemed to enhance the pleasure of everything I tasted. If you’re looking for Dumon, and want to taste the best Belgian chocolate in Bruges, stand in Market Square with your back to the tower and take the street on the upper left. Look for the little shop on your right at the next corner. 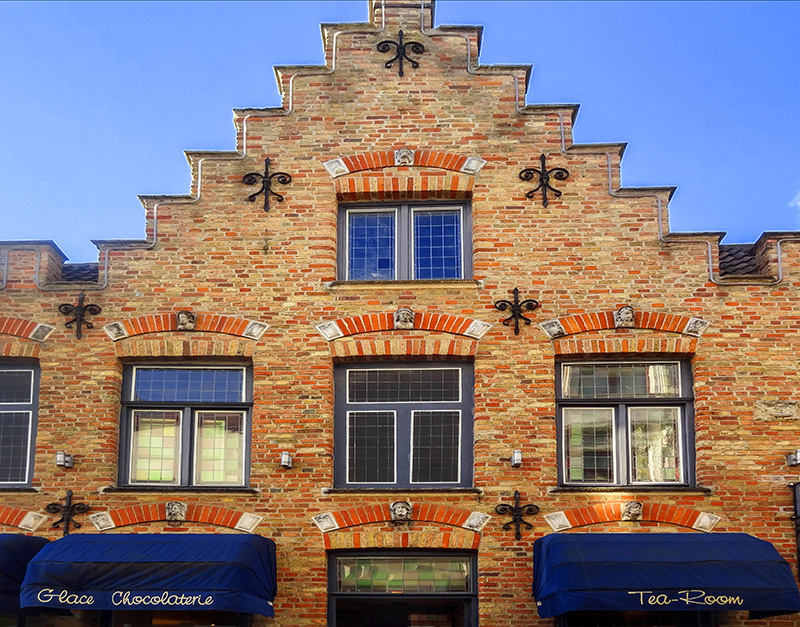 When you tire during your personal search for the best Belgian chocolates in Bruges, you’ll find more than 300 hotels in the city ranging from 5-star properties such as the Hotel Van Cleef, Hotel Prinsenhof, Relais Bourgondisch Cruyce, Relais & Châteaux Hotel Heritage, etc. to many European and American chains including Crowne Plaza, Park Hotel, Belforthotels, Floris Hotels, Martins, and Novotel, among many others. There are also many apartments, B&Bs, and budget properties. Although the latter are usually not in the center of the Old Town, they aren’t necessarily that far afield. The good Ibis Budget Hotel at the Brugge Centrum Station, where I’ve stayed, is an easy 10-15 walk to Market Square. You can find some good hotel deals in Bruges on Booking.com and Hotels.com, especially in the off-season. The Amsterdam to Bruges train is a 3 1/2 hour trip. The fare is approximately $59 – $85 depending on class of service. If you’re in Brussels the train ride is only a bit over an hour and costs considerably less – approximately $11 – 16 per person. Now, I have to add BRUGES to my “to-do” list …. you sure have a tough life … sampling creamy, rich chocolate …. I was once on a tour of Europe with my father and this story brings back a lot of memories of our two days in Bruges. We loved admiring all the historic buildings, yet now after reading your fun story wish we’d had more chocolate!! Jim why haven’t you mentioned THE CHOCOLATE LINE? Its by far the best of all you mentioned. By too far in fact. while I agree totally on Dumon but man…the Chocolate Line!!! Ah-h-h-h-h…another chocolate lover. Our love of chocolate is, of course, quite personal. Which is why I’m glad you’ve brought up your personal favorite chocolatier. If anyone else also has personal favorites, feel free to share them here! And, if ever back in Belgium + looking for a unique Chocolate Experience => try ‘sniffing’ Chocolate. With the Chocolate Shooter, a little ‘machine’ developped for the Rolling Stones, and now ‘open for people like you & me’, you get to ‘shoot’ chocolate powder into your nose. Believe you me – a UNIQUE moment. Surprising to! You can try (and buy!) 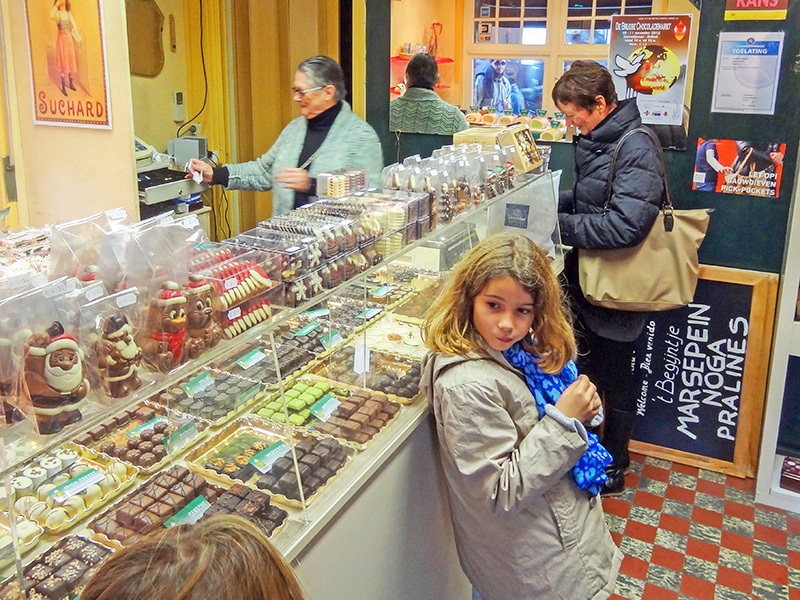 this @Dominique Persoones shops ‘The Chocolate Line’ in Bruges or in Antwerp. I visit Brugge every winter with my wife, occasionally in the busier summer months as well. It’s an easy 6 hour drive from Leicester. 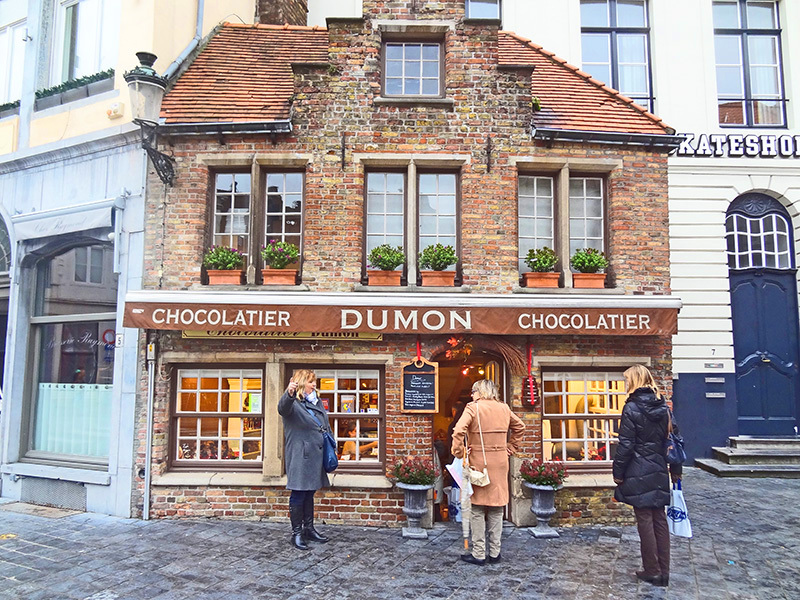 We’ve tried many chocolate shops over the years and Dumon make decent mid-range chocs, but far from the best Brugge has to offer and are a touch pricey compared to their peers. The very best can easily cost twice the mid-priced, so bringing back 1 kilo boxes for family has to have compromises. The little shop is interesting, but very cramped, the mother can be quite rude if you are just browsing. 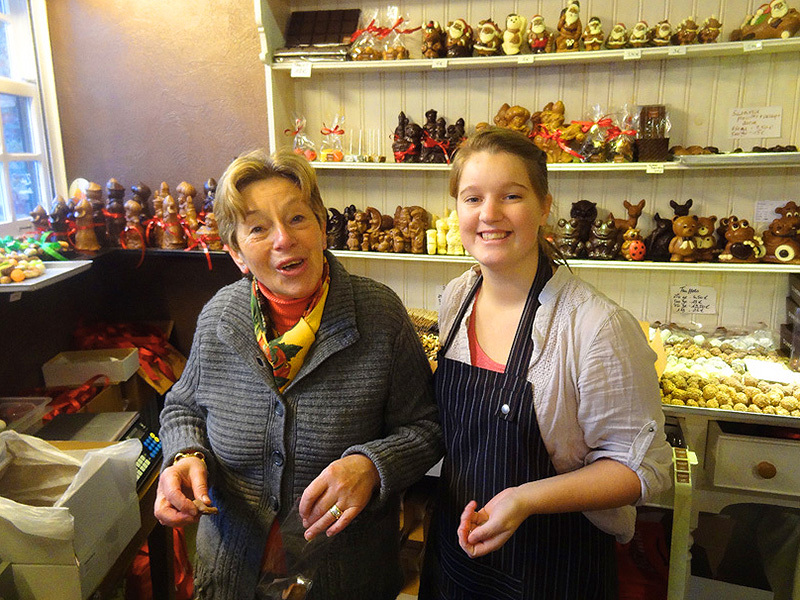 The Old Chocolate Shop is about the same quality, but the owners are much more welcoming. they also have a small hot chocolate café upstairs that serves superb drinks and snacks. I find the chocs made with fresh cream taste more ‘luxurious’ but can have quite a short shelf life. The reviewer is right to point out that the cheap chocolates tend to taste much like the supermarket variety and can be disappointing and taste bland. We’re counting the days (18) until we’re in Brugge again. So what are the best places for chocolate in Bruge? Ny choice is Dumon Artisanale Chocolatier. By far the CHOCOLATE LINE which is missing. I wish I had known about the Old Chocolate Shop when I last visited Brugge but will now keep it in mind for my next visit. I know I’ll be returning since my wife, who hasn’t been there, is pestering me to go with her. And she (and all her office colleagues) loves Belgian chocolates. Hi Jim. I visited a number of chocolate shops in Bruges in July, but my favorite by FAR was DUMON. Yes, it is small. Yes, the elder mom can be a bit ‘brief’ but arthritis pain (and standing on concrete floor for 10 hours a day) could cause ANYONE to be a tad off now and then. Also, I heard numerous patrons who were peppering their conversation with curse words, something which Madame Dumon disapproves of in her shop, as would I. All one need do to receive a warm, genuine smile from her is compliment her shop, or her assortment, or her chocolates. She was warm, smiling, and most accommodating when treated with kindness. As for the chocolates there, I was OVER THE MOON thrilled. Not only do I feel that they have the freshest, most delicious chocolate, they also have STEVIA CHOCOLATE that is completely scrumptious! I have searched high and low for quality stevia chocolate. Theirs is absolutely the best. So good, in fact, that I am already planning another trip to Europe, this time with an empty suitcase specifically to fill with Dumon Chocolates.. Yes, Denise! Aren’t their chocolates incredible? You’ve got me wanting to return already! I found everyone in the shop to be friendly and warm and I would return in a heartbeat if I was anywhere near Bruges. Thanks for sharing your experience. Yum. I ‘m from Belgium and i love choclate. In our vilage we have a litel chocolate schop every thing made by hand . I read your story and thougt i have to tel them about Dumont in brugge but you found them for me won of the best chocolatiers i have ever eaten. Not the chocolatier but his choclates. I would recomand also the chocolates of Peirre Marcolinie it is unbelievable how that taste. You find theme al over the world but very expensive. https://eu.marcolini.com/shop.